Souterrains, underground chambers, are often found in association with ringforts. The Early Christian period (referred to as the Early Medieval period) was a time of profound social and economic change in Ireland. Agriculture and rising population led to further clearance of the forested slopes of the Belfast Hills. The dominant site types associated with this period include ringforts, souterrains and enclosures. Ringforts are undoubtedly the most common archaeological field monument in the Belfast Hills. They are also known as raths and consist of a circular area enclosed by an earthen bank. Most ringforts were enclosed farmsteads, which acted as a defence against natural predators such as wolves or as protection against cattle raids. A line of these raths would have lain across the foothills of the Belfast Hills. Some still exist while others have been lost to farming or housing estates— such as Rathcoole or Rathfern! 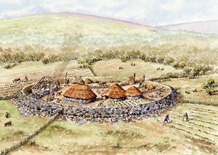 A different type of settlement, an early Christian village comprising of 23 houses, was discovered during an excavation in 1981 in the townland of Ballyutoag. Items recovered included Souterrain Ware Pottery, crude flints, the stem of a bronze dress pin and a fragment of lignite.